A group of Vodacom Super Rugby stars are about to swop running lines for tight lines, and tries for tigers, as they get ready to land their biggest catch of the season in a tiger fishing safari with their fans on the Zambezi River. From 15-18 July, the rugby players – hand-picked from all of the South African Vodacom Super Rugby franchises – will join several lucky Vodacom Red clients on a once-in-a-lifetime Vodacom Red Rewards experience, fishing for Africa’s most iconic game fish on one of its legendary rivers. This unique experience is the next instalment in what has already been a rugby season jam packed with exclusive rewards for loyal Vodacom Red clients. The season kicked-off with the Vodacom Red Father and Son Sleepout on the main field at Loftus Versfeld and was followed by a memorable tour to Christchurch and Sydney to watch the Vodacom Bulls in action, and then a Vodacom Red Track Day racing Ferraris at Kyalami. Now it’s the turn of a stellar cast of fans, rugby players and celebrities such as Radio Raps’ Jonathan and Mack Rapapali from Jacaranda FM to land the catch of their dreams on this 5-star outdoor experience. This group of fishing enthusiasts will be treated to a money-can’t-buy experience that includes luxury transfers, VIP accommodation, fine cuisine, helicopter flips, river cruises and world-class entertainment. They’ll also take to the water with the best fishing equipment and private guides to lead them right to the action. And for once in these rugby players’ careers, the adrenalin of breaking the line will not be their top priority. 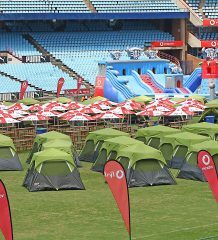 For any Vodacom Super Rugby fan, this is a bucket-list experience sure to grab them hook, line and sinker. To stand a chance to tame the tiger, Vodacom clients must register for the Vodacom Red Tiger Fishing Experience at www.vodacom.co.za/redrewards.